Telangana Public Service Commission (TSPSC) is scheduled to conduct written examination for the recruitment of agriculture extension officer (AEO) posts on 22nd November 2017. Online application submission completed for 851 Telangana Agriculture Extension Officer (AEO) Jobs.A huge number of candidates who are looking for the jobs in Telangana applied for the exam. Candidates who had applied are searching for the TSPSC AEO Final results2017 as it is the crucial document to carry for the exam and contains details regarding exam venue, roll number etc. TSPSC released AEO Final result. Candidates can download admit card from the direct link provided below. Telangana Public Service Commission has released notification for the recruitment of candidates for agriculture extension officer posts. There are about 851 vacant positions for which the notification is released. A huge number of eligible and interested candidates applied for the exam. Candidates who had applied can download admit card from the direct link provided below. TELANGANA STATE PUBLIC SERVICE COMMISSION: HYDERABAD. Recruitment (General) to the post of Agriculture Extension officer Grade-II in Agriculture and Co-operation Department., 790 candidates with the following Hall Ticket Numbers have been provisionally selected for appointment to the post of Agriculture Extension officer Grade-II in Agriculture and Co-operation Department. Notification No.51/2017, Dt: 10/10/2017, against 851 vacancies notified 790 are filled & 61 are not filled for want of eligible candidates. With this Notification of selection, the General Recruitment process notified vide Notification No.51/2017 for the post of Agriculture Extension officer Grade-II in Agriculture and Co-operation Department has been finally concluded. The selections are subject to the final outcome of W.P.s and other cases pending, if any, before Hon’ble Courts of law. These selection rounds will be conducted by the selection board of TSPSC for shortlisting the suitable candidates. You must qualify in the first round of selection to get forwarded to the consecutive selection process. The TSPSC AEO examination is objective type consists of 2 papers for 300 marks. Concerned Subject – 150 Questions – 150 Marks. The Examination held on 22nd Nov' 2017. 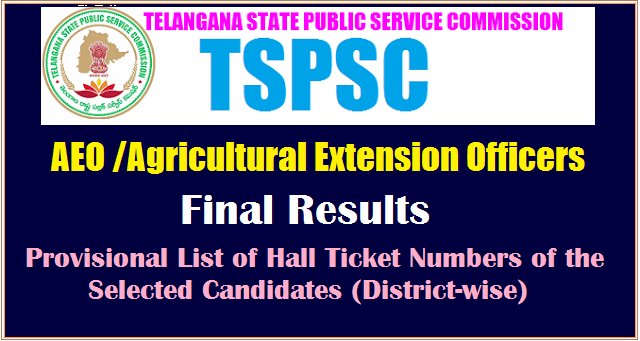 Click on TSPSC AEO Final result. The Final resultswill appear on the screen.